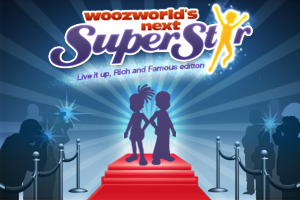 PrimaryGames Official Blog: Woozworld’s Next Superstar (WNS) – Let the Auditionz begin! Woozworld’s Next Superstar (WNS) – Let the Auditionz begin! You keep hearing about the WNS Live it up, Rich and Famous Edition, but we bet you wonder “What can I win?” Well, prepare to be amazed and to fall off your seat! Actually, you might want to go get a helmet before you keep reading! •A super exclusive Golden Helicopter with your own private pilot! •A complete new wardrobe including some very fashionable items not yet released in Woozworld. •A pack of Superstar Spellz! •The Glory Crown, awarded during the Coronation Ceremony! •Your own personal statues displayed in the upcoming Star-Dome! And of course, the joy and pride of being a Superstar! So who are the two lucky Woozens who will become Woozworld’s Next Superstars and live the big life? See you at the Auditionz!